Time and again, Education Loan Task Force (ELTF) has been blaming the Government of India for not settling 100% of the eligible interest subsidy during the moratorium period. ELTF has taken up this issue through our supporting MPs in the Parliament. 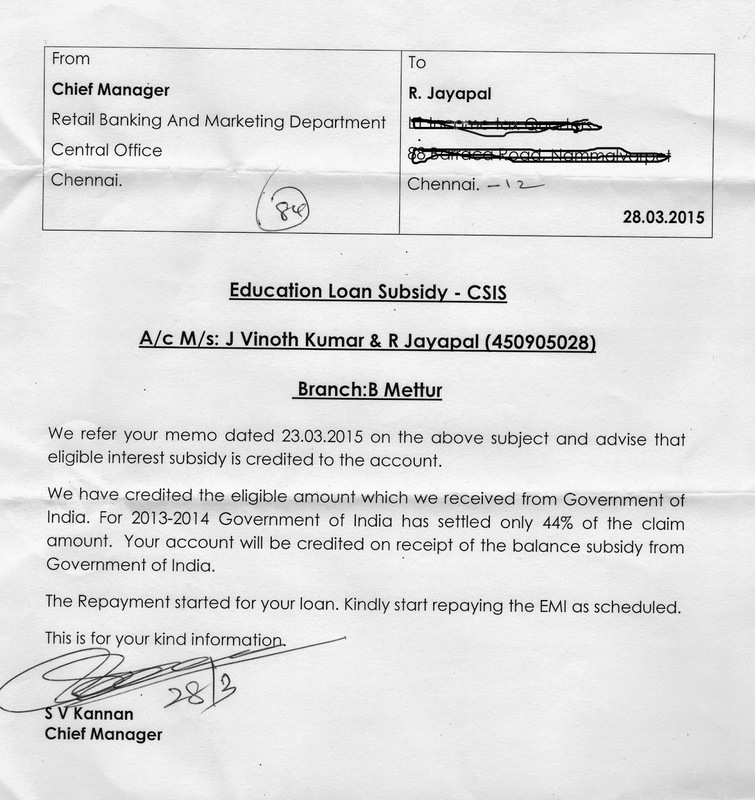 Now in response to a letter of Shri Vinoth Kumar, a student borrower of Indian Overseas Bank, B. Mettur Branch, the Bank's Head Office has confirmed that only 44% of the claim was settled by the Government for the year 2013-14. As per rules, the Government of India should settle 100% of the interest during the moratorium period. In many cases, the students get only a small portion. The banks force the students to pay the balance interest and treat them as NPA. The eligible students can now individually approach their branch manager and request them in writing (1) the amount of interest debited in the loan account during the moratorium period and (2) the amount of interest subsidy credited to the loan account. Alternatively, you can collect the statement from the Bank and work out the details yourself. If the students need any clarification, they can approaqch the bank manager. If the Managers do not clarify, the students can meet the Regional Manager and give a written complaint. Students should note that there are two interest subsidy schemes. (1) for loans granted on or after 1st April 2009 - it is a continuous scheme. Due date for submission of claims by banks is over for the period up to 2013-14. (2) For the loans granted prior to 1.4.2009 and outstanding as on 31.12.2013. This is one time scheme and now the due date is over for submission of claim. For more details, please see the guidelines in this site. If there is a difference, the students can also ask the Bank Manager the details of the claim submitted by them on behalf of the concerned loan account. If there is any discrepancy in the interest subsidy received or claimed, the students can send a written complaint to the Chairman of the Bank. Please do not post any comment for this posting. If you need to convey anything, please send a us your mail to info@eltf.in.